Prasanna Purple has a long history of more than 30 years in passenger mass transit operations and has pioneered mobility solutionsin the country. We have a highly-trained and motivated team of professionals handling the operations 24/7. We have an array of mobility solutions like City and Intercity buses, Bus and Car rentals, Employee Mobility and school bus services, Hop on Hop off city sightseeing services, Corporate MICE movement, Individual and group tours. 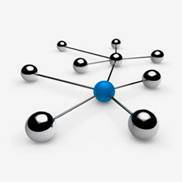 We understand the concept customer servicevery well duepartly to our vast experience. Today, we operate 1200+ vehicles of different categories and carry 240 Million Passengers by our city buses and 1.5 million passengers on intercity buses per annum. We maintain very high level of service standards andto achieve this, we train our staff from all profiles for at least 52 hours per year. As our corporate social responsibility we are very sensitive to environment, health and safety related issues and we practice it as a priority. We operate Transport services in 6 prominent Indian cities under the ‘Public Private Partnership’ initiative taken by the Central Government. Our capabilities includes planning, designing of routes, schedules, frequency, training of crew, monitoring performance of buses and overall management of city bus operations by making use of modern technological tools such as Vehicle Locator Device (VDL), Intelligent Transport Systems (ITS), Passenger Information System (PIS), Web based video surveillance systems. We also make use of specially designed software systems like Trapeze to plan and monitor performance of daily operations more efficiently. These are City to City Super Luxury air-conditioned coach services. We operate on all major routes with high end super luxury buses like Volvo, Mercedes and Tata sleeper coaches. We have a very strong presence in Maharashtra and important cities from neighboring states. Pune is our main hub operating 75 schedules every day with a fleet of 110 buses. We operate tours by luxury coach which includes tours to beaches, hill stations, forts, and pilgrimages. Our Astavinayak Yatra covering 8 Ganpati Darshan is most popular amongst Maharashtrians whereas Shirdi Sai Baba Darshan with Shani Shingnapur is all time favourite. Along with this, our weekend gateways to Konkan and Mahabaleshwar are also very popular. More than 15000 tourists catered this service during year 2011. We offer great holiday packages to individual, families and groups in India & abroad. Our custom built tours as well as fixed date departure tours is very popular amongst tourists. Our products range from Beach Resorts to Hill Station getaways, Adventure experience to Amusement Parks. In Corporate tours we customize solutions for various MICE (Meetings, Incentives, Conferences and Events). We take responsibility from initial stage of planning including pre-tour familiarization visits, booking of air seats, arranging accommodation at the finest hotels, gala dinners, collateral preparation, technical back up, meal arrangements and event management. India's first Hop on Hop off (HOHO) sightseeing tour service which was launched in Delhi under the flagship collaboration with Delhi Tourism. HOHO has 14 low floor Air-conditioned buses which loops around 19 major tourist destinations and 100 additional adjoining sightseeing points. Car and Bus hire service for Individual / Corporate. Our commitment to provide timely and efficient service has helped us to widen our loyal customer base. Our fleets are hired for Corporate events, Family picnics, Airport Transit, etc. Prasanna Purple has a long history of more than 25 years in passenger mass transit operations and has pioneered the art of surface mobility solutions. We have a highly-trained and motivated team of professionals handling the operations 24/7. We have an array of mobility solutions like City and Intercity buses, Bus and Car rentals, Employee Mobility and school bus services, Hop on Hop off city sightseeing services, Corporate MICE movement, Individual and group tours. We understand the concept of human logistics very well due to our vast experience. Today, we operate 1200+ vehicles of different categories and carry 240 Million Passengers by our city buses and 1.5 million passengers on intercity buses per annum. We maintain very high level of service standards; to achieve this, we train our staff from all categories for at least 52 hours per year. As our Corporate social responsibility we are very sensitive to environment, health and safety related issues and we practice it as a priority. For better last mile connectivity, and as an initiative to provide integrated transport solutions to citizens, we operate Metro Feeder services. We make use of the latest technology including a mobile app based employee transportation solutions. The technology used for Women’s Safety has been awarded & recognised by the Government of India, Ministry of Home Affairs. Indian population is growing fast, and it has created a huge demand for schools. For better and safer transport, schools provide transport facilities to students studying in their schools. Under this activity, we supply buses to schools to fulfil their requirement. Some of the schools who do not wish to take the responsibility of transportation of students with them; we provide services directly to students on payment of annual subscription. We make use of latest monitoring technology to ensure safety and security of the students. We provide intercity commuting services with high end Super Luxury air-conditioned coaches. We operate on all major routes within Western India from major cities such as Mumbai, Pune, Ahmedabad, Indore, Goa etc. Our coaches include seating coaches, semi sleeper and sleeping coaches which are unique to India. Within the coaches, we provide individual infotainment systems. We encourage passengers to transact on the website & mobile app for their booking, selection of seat, payments, cancellations, tracking of their coach etc. Delhi: India's first Hop on Hop off (HOHO) sightseeing tour service, which was launched in Delhi under the flagship collaboration with Delhi Tourism in 2009. HOHO has 14 low floor Air-conditioned buses which loop around 19 major tourist destinations and 100 additional adjoining sightseeing points. Goa: We have started a similar sight-seeing service in collaboration with Goa Tourism at Panjim, Goa with Double Decker buses (Open Top) from December 2016. These buses will have location based multi-lingual running commentary about the monuments & its history with the help of mobile app. These services have well trained Tour Guides/Guest Relationship Executives (GRE) to assist tourists. Tourists can use these services by taking a 1 or 2-day pass. We offer multiple options for families and groups. We operate short distance tours by luxury coach which includes tours to beaches, hill stations, forts, and pilgrimages. Along with this, our weekend tours to important tourist places of leisure and pilgrimage are also very popular. These services are professionally managed by well-trained tour managers. These services are inclusive of transportation by luxury coaches, accommodation, food, and are escorted by experienced tour guides. We offer great holiday packages to individuals, families (FIT) and groups (GIT) in India & abroad. Our customized as well as fixed date departure tours are very popular amongst tourists. Our products range from Beach Resorts to Hill Station getaways, Adventure experience to Amusement Parks across the globe. Our expertise lies in designing itineraries and executing tours for special interest groups such as Architects, Real Estate Developers and Farmers. In Corporate tours we customize solutions for various MICE (Meetings, Incentives, Conferences and Events). We take responsibility from initial stage of planning, including pre-tour familiarization visits, booking of air seats, arranging accommodation at the finest hotels, gala dinners, collateral preparation, technical back up, meal arrangements and event management. We have a wide variety of range in Cars and Buses. We have a fleet of cars ranging from Economy, compact, mid-size to full size sedans & SUV. We have buses with a varied seating capacities right from 13, 18, 28, 35, 45, 49 to 53 seaters in air conditioned and non-air conditioned categories, similarly in luxury to super luxury segments. Our commitment is to provide timely and efficient services which have helped us widen our loyal customer base. Our vehicles are hired for Corporate Events, Family Functions, Airport Transfers, Weekend getaways etc. We train our drivers regularly on safety and security and other important aspects like emergency evacuation procedures etc. We have had the honour of becoming official travel partners of many international sporting events including the Commonwealth Youth Games. We were the official travel partner to Indian Cricket Team, catering for their entire logistic requirement during International matches. 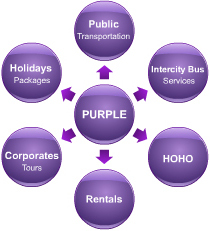 We conceive and develop customized tour packages for large groups and our focus is dedicated to our corporate clients. We at Purple Xperience are geared up to provide you a safe, comfortable and seamless tour to Ramoji film City. We ensure a comprehensive event, fun filled entertainment and offer an experiential journey into the celluloid world, an interactive infotainment, colourful shows and a host of Multi-Cuisine Restaurants at Ramoji Film City. You can be rest assured and trust us for the best of experiential tour of Ramoji Film City. Likewise, we also organize end-to-end tours of large groups to Imagica (Khandala, Maharashtra) for a day’s tour or an over-night tour including the travel, food, park entry including lunch. We conceptualise, organise and conduct MICE programmes, Channel Engagement Programmes, Rewards & Recognition events across several domestic and international destinations or conduct events as and where we are guided by your organization. Purple has become a member of Global Passenger Network (GPN) in 2016, the first company in India to be a member of this prestigious organization.